The United States will find that the world will not stand still. With or without American co-operation the nations will proceed as best they can to deal with the many ecological and social problems which beset us, and which so urgently must be addressed. America will find itself left behind and ignored, and only then will it be prepared to �lead� the way. A great man of our time has died, great, yet abused by his enemies, and misunderstood even by his friends. He was a man of vision and extraordinary courage and optimism, an inspiration and father-figure for nearly half a century to the oppressed people of Palestine. He has been the target of the implacable hatred of Mr Sharon for decades, and the Israeli propaganda machine has accused him of every manner of mistake, misdeed and mishandling of opportunity for peace. The mud has stuck and he is seen, even by erstwhile friends, as a �flawed� President. He was nothing of the kind. He was invited to and attended, as did the late King Hussein of Jordan, the three-day Conference which Maitreya held for over 300 people in London in April 1990. Since then, he worked under the immediate inspiration and guidance of Maitreya Who told him, again and again, not to accept an agreement which is unjust. Every agreement put forward has been unjust, and, being unjust, would not have lasted. Q. Could you please give the ray structure and point of evolution of Yasser Arafat (1929-2004), President of the Palestinian Authority? A. Soul: 6; Personality: 4 (sub-ray 6); Mental: 1 (sub-ray 4); Astral: 6 (sub-ray 6); Physical: 3 (sub-ray 7). Point of evolution: 2.4. In terms of spiritual development Yasser Arafat was the equivalent of former US President John F. Kennedy (PoE: 2.4) and more advanced than Mahatma Gandhi (PoE: 2.0). [A ray is, according to the Master DK, �but a name for a particular force or type of energy, with the emphasis upon the quality which that force exhibits.� Rays thus qualify all creation, including the human constitution. Soul, personality, mental body, emotional body, physical body, all are coloured by one or other of the seven rays. In order to facilitate study and comprehesion of the rays, Benjamin Creme�s Master, over the years, has kindly provided requested information on the ray structure (and point of evolution) of well-known individuals, but for reasons of privacy, never of living people. The figures in the given order represent: (S) Soul ray; (P) personality, major and (sub) ray; (M) mental body, major and (sub) ray; (A) astral/emotional body, major and (sub) ray; (Ph) physical body, major and (sub) ray; (PoE) point of evolution. Q. Was Yasser Arafat poisoned? A. No, he died of a broken heart. Q. Was Yasser Arafat foolish not to accept the peace plan proposed by former President Ehud Barak of Israel? �� We seek true independence and full sovereignty: the right to control our own airspace, water resources and borders; to develop our own economy; to have normal commercial relations with our neighbours and to travel freely. In short, we seek only what the free world now enjoys and only what Israel insists on for itself: the right to control our own destiny and to take our place among free nations�. �Peace is not a signed agreement between individuals � it is reconciliation between peoples. Two peoples cannot reconcile when one demands control over the other, when one refuses to treat the other as a partner in peace, when one uses the logic of power rather than the power of logic. Israel has yet to understand that it cannot have peace while denying justice. As long as the occupation of Palestinian lands continues, as long as Palestinians are denied freedom, then the path to the �peace of the brave� that I embarked upon with my late partner Yitzhak Rabin will be littered with obstacles�. �The Palestinians have a vision of peace: it is a peace based on the complete end of the occupation and a return to Israel�s 1967 borders, the sharing of all Jerusalem as one open city and as the capital of two states, Palestine and Israel. It is a warm peace between two equals enjoying mutually beneficial economic and social co-operation. Despite the brutal repression of Palestinians over the past four decades, I believe when Israel sees Palestinians as equals, and not as a subjugated people upon whom it can impose its will, such a vision can come true. Indeed it must. Each winter, the sun sets earlier and earlier until, on the shortest day, we see it, if at all, for but a few brief hours. Such is the reality of our planetary life. However, experience has taught us that, without fail, the days will gradually lengthen and the blossom of spring and the warmth of summer will return once more, bringing us renewed hope and joy in living. When one considers this, when one sees how inevitable is change, one sees also how unnecessary is despair. Despair strikes at the heart of truth, for the truth is that nothing remains the same for ever, not even the darkest-seeming fate. Since this is so, what is to be gained by fruitless despair? Better it is, by far, when the blows of karma seem difficult to bear, to await calmly the appointed hour of change in the sure knowledge that it will come. True joy in living can be ours only when we learn to accept with equanimity the blows and the gifts of life. Such a one is a disciple. Such a one knows that naught in this universe stands still; all is in movement, constantly changing and assuming new forms. Consider, then, how vain it is to expect the present to persist. This insight engenders freedom; from that freedom spontaneously arises joy. Joy must be understood to be the natural state, underlying happiness and sorrow alike. When uncovered, it radiates its light � the light of the Soul � on all around and makes manifest the love which is the nature of God. Love and joy co-exist in the heart which is pure, unclouded by fear, hate or the anguish of despair. Remove fear from your heart and know joy. Release yourselves from hate and know the meaning of love. Cast from you dark despair and stand in your true light. Thus can you enter the Kingdom of Souls and become a saviour of the world. Many approach the future with fear, knowing little of the glory which awaits them. For them, naught beckons but bleak destruction. Show them that the future for man will be wonderful to behold, holding as it does the promise of revealed divinity. Trust is not easily engendered but the light of joy will prove the best ambassador. Teach the young to express the joy which is their birthright and place not upon tender hearts the weight of guilt and fear. Thus will be born a generation of joyous servers of the race. Take Us, your Elder Brothers, as your example; the radiance of Our joy is Our hallmark. Emulate Us, and spread abroad joy�s light. Conquer fear and uphold the hope of others; fear and joy are equally infectious. Demonstrate love and joy and close firmly forever the door upon despair. Do this and you will aid mankind more than you could know. In one of the Master�s articles from several years ago, He assures us that Light will prevail and says: �There is no need to fear in the present conflict� and �this being so, naught can disturb the plan for the rehabilitation of the world�. Has the re-election of Bush created something that has altered the greater Plan spoken of? �Too terrible to contemplate� is certainly a long way from: �naught can disturb the plan for the rehabilitation of the world�. Thank you for your time and dedication in this most challenging of times. A. No. The Plan is working out despite the troubles on the physical plane. The American people will realize the mistake they have made and come back into reality � but will have to suffer a bit first, I�m afraid. Also, Kerry really won the election; only the cheating and vote-rigging of his opponents robbed him of the prize, and these Americans are still there and will not give up. Q. (1) Does the final outcome in the US Presidential election accurately reflect the preference of those who voted, or (2) was there any corruption or manipulation which might have changed the outcome? If so, (3) which side cheated more? (4) If the results were �fixed�, by which methods was it done? A. (1) No. My information is that there was much cheating. (2) Yes, Kerry should narrowly have won Ohio and Florida and the Presidency. I am afraid it is the same old story, more expertly performed this time. (3) The Republicans. It seems that cheating by Democrats was minimal and only on a personal basis, but cheating by Republicans was pre-planned and widespread, especially with the new electronic machines. (4) Pre-programmed electronic voting systems and various other methods, cruder but just as effective � delayed postal votes, double voting, non-counting of votes, and more. Of course, the marginal (swing) states like Florida and Ohio were targeted and the machines were programmed to change every fifth vote for Kerry to a vote for Bush. However, even without �stolen� votes, Bush, like Gore last time, did in fact decisively win the popular vote which I personally prefer as a record of democratic public opinion. Q. In view of the very suspect election results in the US could your Master please say how many Democrat votes were illegally blocked by one means or another? Q. In Ohio unemployment is rising and there are various well-grounded reasons for discontent among voters; please help a European understand the results. It seems incredible and illogical to vote for a government which causes hardship at home and chaos abroad! A. My information is that it was a very flawed election again. It hardly seems possible that Ohio would not bend over backwards to deliver a Democratic victory. Q. Could Bush�s win in the US election actually hasten Maitreya�s public emergence, by bringing forward the economic crash, because of Bush�s destructive economic policies? A. No, I don�t think so. Q. (1) With Bush�s �win�, does that bring the world closer to the �edge of the abyss� that Maitreya has mentioned? (2) Do you have any sense of how long we would have to be stumbling along the edge of the abyss before we come to our senses? Or will other factors such as a financial crisis bring us to our senses? Q. Can we (please) expect Maitreya to do His first interview sooner than perhaps even He planned before the elections in the US? A. No, I don�t think so, but in any case, my information is that we do not have long to wait. Q. (1) Is there anything that anyone, including those in the �Emergence groups�, both in America and around the world, can do to help speed Maitreya�s emergence? (2) Is it more imperative than ever now that your information be made known as widely as possible? A. (1) Make His presence known! (2) Yes. Q. Will the outcome of the US elections polarize society both in the US and abroad even more than it is already? A. Yes, for a time. Eventually, and relatively soon, Maitreya�s hand and energies, especially those of the Spirit of Peace and Equilibrium, will make their presence felt more strongly, and unexpected and welcome changes will take place worldwide. This is not the end of the world. Q. I know several people who seem quite compassionate, sincere, and intelligent, but who none the less whole-heartedly support George W. Bush and apparently believe that what he and his administration are doing is in the best interest of the United States and the world. How can this be? Can you shed some light on this apparent paradox? A. Mr Bush�s supporters, half the American electorate, must have among them many people who are sincere, intelligent and reasonably compassionate (if only on a rather narrow front). What they do seem to share is an extraordinary political naivet� which allows them to return to power a man who has lied to them; led them into a disastrous war; squandered their economic well-being and limited their traditional liberties in the name of a vain �war on terror�. I believe it is the result of the destructive self-deception of America�s 6th-ray personality, in other words, glamour, illusion and fear. Q. Do you think Osama bin Laden timed his video precisely because it suits his purposes to have Bush in the White House? Q. President Putin congratulated the American people for �not giving in to terror�. (1) Am I insane to think that is just exactly what they did � give in to fear and the �bogeyman� of terror? (2) No doubt we can expect more trauma for both Chechens and Russian citizens. A. (1) That is exactly true. 9/11 completely traumatized the American people whose fear was worked on and kept going by the Bush administration. (2) I�m afraid so, yes, but that would still happen if Kerry had been elected. Q. What can we expect from Israel with Bush�s so-called victory? What effect will it have on Israeli policy? A. More of the same. They will be delighted. It will strengthen their hand and tough action, but Mr Bush is committed to addressing the Israeli/Palestinian problem and has spoken specifically about the necessity of a �viable� Palestinian homeland. So the Israelis will have to compromise. Q. Many people in the media seem to believe that Sharon�s Gaza �pull-out� policy is a genuine move towards peace. Your comment please? A. I do not share that belief. I think the exodus of 8,000 Israelis from Gaza is seen by them as a bargain �quid pro quo� for hundreds of thousands of Israelis in huge and continuing settlements in the West Bank, which was to be the Palestinian homeland. Now, only a fraction remains to the Palestinians as a viable home, and no curb on the building of Israeli settlements has been imposed. Q. The national security adviser to the first President Bush, Brent Scowcroft, has said recently that the current President Bush is influenced to a great degree by the Israeli Prime Minister Sharon. �Sharon just has him wrapped around his little finger,� Mr Scowcroft was quoted as having said in his interview to the UK�s Financial Times. He was also quoted as saying the US President is �mesmerized� by the Israeli Prime Minister. (1) Does this have something to do with the fact that Prime Minister Sharon is wielding some very powerful black forces? (2) President Bush is obviously influenced by those forces as well but is Sharon more �under their spell�, so-to-speak? A. Israel is the central point in the triangle Israel-USA-States in Eastern Europe, and Mr Sharon is the most powerful exponent of the nefarious energies which are used and potentized by that triangle. It follows, therefore, that he has much influence over Mr Bush and his entourage. Q. South America has succeeded in electing three left-wing leaders, unlike America. Do you think it could lead to really useful co-operation and a new chapter in social reform and improved living standards for South America in general? A. Yes. Profound changes are taking place, and will continue to do so, in South America and elsewhere, which are quite separate and distinct from events in the USA. These will change the meaning and appearance of the �leadership of the free world� by the USA which will be seen more and more to be tackling only old problems in old ways. Unless the USA grasps the challenge of change in a speedily changing world, it will be bypassed and left behind by countries undergoing positive change of their own, leaving the USA isolated and strong � but impotent. Q. Will the daily recitation of The Great Invocation speed the coming of Maitreya? A. Yes, and the emergence of those Masters Who are planned to externalize Their work. Last summer I was in Assisi, Italy, in the Church of St Francis. My niece and I sat down in the church. Suddenly tears began streaming down our cheeks � both of us! We weren�t crying really but the tears just flowed. Then my left hand became very hot and when I took my niece�s hand in mine she dropped it in shock at how hot my hand was. It felt as if I had a burning coin pushed into my palm. That feeling remained with me throughout the day and even now, when I think about it or tell others about the incident, that spot gets very warm again. (1) Is this a sign for me? (2) Should I, or may I, do something with my hands? Could you please explain the incident in the church? I don�t really know what to make of it and what I should do about it. I would be grateful for your insight. On Tuesday evening, 2 November 2004, I was on my way to a Transmission Meditation group in Richmond, Surrey. I had arrived at Richmond station slightly early. As I came out of the newspaper shop, a young woman, who was about 16 to 18 years old, came up to me, and asked if I would give her some money for a bed ticket for the night at a hostel. She was small, and wore a black leather jacket and a gold cross around her neck. She seemed to me to be vulnerable, and also very frightened. I put my arm on her shoulder and asked what had happened. She said she was homeless and could not bear to sleep outside another night. I got my purse out and gave her some money, but felt I ought to enquire more about the situation she was in. I asked if she knew about the Vineyard Project in Richmond, which does a great deal to help the homeless, and where I had once done some voluntary work. She said she had been there but they could not help her. I did not know quite what to make of what she said, for youngsters who are really at risk are always helped. Was it because of a question of drink or drugs, they had not helped her for some reason, or had they specified a hostel she was afraid to go to? There was no sign to me that she had been drinking or was on drugs. She started to get emotional and said she was very, very frightened. �What is making you so afraid � is someone following you?� I asked, glancing around to see if there were any men following her. �No, no,� she said. I then remembered there was a hostel for the homeless just about five minutes away from the station, so I suggested we go there and see if they could help. She said she had already been there, and they could not help her. I suggested that we go to the hostel together, and I could ask on her behalf, which she agreed to do. The woman behind the desk said that they could not take her in without a referral form from a centre in Twickenham, which was closed until the next day. So where can she go, I asked. �There is nothing we can do. I am sorry, but that is the situation, people are homeless,� the woman replied. When we got outside the young woman was very upset. I opened my purse to find there was only a very small amount of cash, which I gave her. She asked if I would stay with her and go and help her beg for money. I remembered that I had a credit card, so we went to a cash machine to withdraw the money she would need for a bed ticket at another hostel up in London. The young woman was overjoyed, very relieved and put her arms around me. I had felt such an affinity with her as we walked to and from the station. She had asked me if I went to church. I said that the only thing that matters is love. Was the frightened young woman just needing money for a bed for the night � or was there something else behind what happened? AH, East Sheen, London, UK. It was 17 October 2004, the last morning of the three-day European Social Forum at Alexander Palace in London, where several of us hosted a stand. It was an extremely worthwhile event, with thousands of people attending, and there was much positive interest in the Reappearance information. During a pause after a busy couple of hours, a man came to the stand. We greeted him, and he indicated that he was French and spoke no English. He was very smart, wearing a dark coat. He was perhaps about 60 years old, with olive skin and a full head of longish �crinkly� hair. His eyes were light and sparkling. The two of us at the stand could speak some French, so between us we gave him a brief story. We mentioned a Great Teacher (Grand Professeur) using arms to emphasize �great�. He replied: �Plus petit,� (smaller), using finger and thumb to emphasize smaller. �A teacher for the world,� one of us said and he added: �Un professeur du coeur,� (teacher of the heart), touching his own heart. We agreed enthusiastically. He smiled warmly and went off. Could he have been Maitreya? SP and HS, London, UK. One Monday evening in September 2004, after Transmission Meditation, I was sitting mulling over things and realized that I hadn�t had any experiences with the Hierarchy for a while and I wondered if They had forgotten me. We parted and only after I�d gone some distance did I realize what an extraordinary meeting it had been and that it could perhaps have been Maitreya. I turned around and although it was quite an open area he was nowhere to be seen. Was the young man Maitreya? Weeping Madonna statue in Rabat, Malta. Photograph taken at the chapel in Malta shows a light blessing from the Master Jesus. 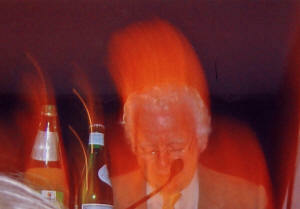 During his lecture in Munich, Germany, on 23 October 2004, Sobeida Lugue took a photograph of Benjamin Creme in the break before the question and answer session. The light surrounding Benjamin Creme is an overshadowing by Maitreya. Unusually, the bright orange light could be seen on the digital display before the shot was taken. 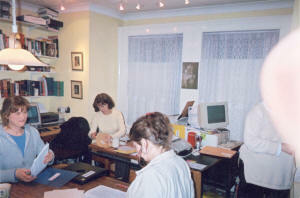 Photograph of Share International office in London shows a light blessing from Maitreya. Taken by Todd Lorentz, Canada, in April 2004. A magnitude 6.8 earthquake hit the remote mountain villages and towns of Niigata Prefecture of Japan on 23 October 2004 around 6pm. The epicenter was about 13km below and a massive landslide occurred. Mrs Takako Minakawa was driving home on the hillside road with her two children, Mayu (3 years) and Yuta (2 years) when her car was suddenly swallowed by rocks and mud and slid down the hill. The rescue helicopter spotted the front end of the car barely visible in the mud. Due to the precarious location and the numerous severe after-shocks, it was 4 days after the quake when the rescue team finally reached the site. Unexpectedly a faint sound of a human voice was heard. When they removed the rocks and mud carefully by hand, they found a little boy standing in the tiny space (1metre high by half a metre wide) created between the car and a rock. He seemed to have crawled out from the back seat of the car. His sister, Mayu was sitting in the back seat which was completely crushed. His mother seemed to have died from the initial impact in the driver�s seat with her hands still on the steering wheel. When they pulled out the little boy, Yuta, he was wearing only a T-shirt and diaper. His legs were exposed. He had been standing in the dark cold space for 92 hours (temperatures dropped to 8 degrees centigrade at night). His body was still warm, and only slightly dehydrated. He was not hurt except for a slight cut on his forehead. When he was asked if he had drunk anything, he replied �milk�. According to experts, it was extremely rare for people to survive more than 3 days, buried like that, because of darkness, cold, loneliness and fear. The entire nation breathlessly watched his dramatic rescue and was deeply moved by the preciousness and power of life. A 15-year-old Indian girl has been admitted to hospital after tiny stones began emerging from the corners of her eyes. Doctors say they have never seen anything like it before, and cannot explain it. Residents of the girl�s village in the state of Jharkhand say that either she is possessed by an evil spirit, or she is an incarnation of a goddess. Savitri, the 15-year-old girl, says before the stones emerge she suffers from excruciating pain in her head. Tiny stones have also emerged from her ears, nose and mouth. Several doctors have come forward to say they have treated Savitri and observed the stones. Savitri and her family say they are desperate to find a cure for her condition. Her bedside at the hospital has been swamped with reporters, but the family say no one has come forward with any offer of medical help. A white marble bas-relief statue of the Madonna in the Dominican Convent in Rabat (also known as Victoria) on the island of Malta is weeping tears of blood. Tests have proved that the blood is human. A commission was appointed by Archbishop Joseph Mercieca to investigate the case of Our Lady of the Cave in the Rabat Dominican church. DNA tests have shown that the tears of blood are definitely human; the commission said that they were not aware of any tampering with the statue. The red tears show up dramatically on the pure white marble and were first noticed in May 1999. The statue, usually kept in storage, was taken out for the titular holy feast day. On 6 May 1999, the first tears were noticed by Rita Bugeja. However, sacristan Martin Caruana wiped the blood off the statue saying that if it was a genuine miracle the Madonna would weep again. A day later the tears of blood were seen flowing down the left cheek of the statue. The bas-relief, a replica of the original marble image of Our Lady which had been replaced some years previously, was removed to a secure location while tests were carried out. It remained in the priory chapel for about two years, but in 2003 the Archdiocese of Malta gave permission to the Dominicans to allow people inside the chapel to see the statue. 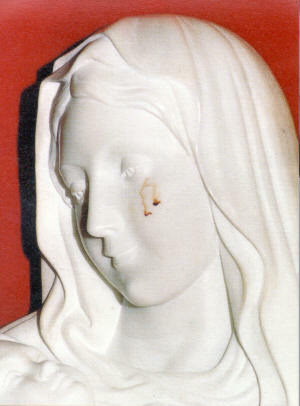 Brother Micallef, who looks after the chapel, said that the Madonna with the mysterious red marks on the left cheek attracts many visitors although nobody can get too close to it as it is kept in a glass case behind a locked wrought iron door to prevent tampering. 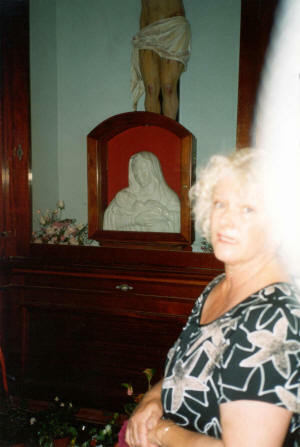 Dutch Share International co-worker Nancy de Graaf was photographed while visiting the chapel. On development a column of light was seen on the photograph. Numerous unidentified flying objects were seen in the sky for several minutes on the morning of 28 October 2004 in the area of C�rdoba-Orizaba, Veracruz state, Mexico. Just after 8am, school students, parents and teachers attending morning assembly saw some white dots in the sky that resembled balloons. A principal of the Constitucion de 1917 High School said there were five or seven objects in the sky at first, with the number increasing to 14 or 16. �They were white, not shiny like stars. They moved in a circle at first and then they headed in single file toward Orizaba,� the witness said, adding that students and teachers alike witnessed the event, which lasted some 25 minutes. Also in Orizaba, at the Carlos Cardenas Rojas primary school in Colonia Cidosa, mayor Martin Cabrera Zavaleta was leading a civic event when one of those present asked that people look up to see some balloons in the sky. �First they were six, then nine. Suddenly they started moving while others remained fixed,� said one witness. Two of the objects moved toward one side and six toward the opposite side. One of them remained motionless and finally all of them vanished. Professors, parents, students, reporters and municipal authorities were witnesses to the event, which was also seen at other schools and sites. American Greg Palast is the author of The Best Democracy Money Can Buy (see review in Share International July/August 2002). Michael Moore calls his reporting for BBC television �courageous�, and Noam Chomsky says he �upsets all the right people�. In the UK, Palast is known as �the most important investigative reporter of our time� (Tribune magazine, UK). But his award-winning investigative reports have been banned from US airwaves. His articles for the UK�s Guardian newspaper have been stopped at the border. Greg Palast is best known in the USA for his reports on the theft of the election in Florida and the connections between the Bush family and the bin Ladens which form the basis for Michael Moore�s latest film, Fahrenheit 9/11. Share International: Many people suspect that there was widespread cheating during the November 2004 Presidential elections in the US � more than there was in 2000. It seems the Republicans have perfected the art of corrupt election practices. Is that your view? Greg Palast: I think that the Republican Party got away with stealing the elections in 2000 and we have no doubt about it, we have hard evidence, which is what you see in my book, The Best Democracy Money Can Buy. This time they again used a whole range of new tricks and old. SI: Could you give an idea of what some of those tricks were? GP: The old trick was to continue removing voters under false pretences from the voter roll � as criminal, who are not criminals. They expanded the concept of supposed �illegal voter� and mounted, for the first time in half a century, a wide-scale attack on the right of black Americans to vote. They challenged the registration and then they challenged the actual right to vote, for hundreds of thousands of black people. GP: It is astonishing. The merest technicality was enough for the Republicans to mount a challenge � like someone might have written their signature a little differently, or added an initial, or moved their home a short distance, or they didn�t have a particular ID card with them, and so on. I checked with election officials in Florida where I was able to obtain a list of thousands of black voters that the Republican Party had challenged. And 12 election supervisors told me that in their entire careers they had never before encountered a single challenge to someone voting. SI: So black voters were particularly targeted? GP: This was done in the days of segregation. During that segregation period in the South there were in fact no laws against black people voting � but there were a string of regulations and rules that would be applied to black people to prevent them from voting. The Republican Party returned to that old trick in this election, of taking minor rules and suddenly applying them to black voters. It�s very easy to do � black and white people don�t live together in the States and we vote in separate precincts. SI: What about people from other ethnic backgrounds, such as Hispanics? GP: I�ve just received information about a massive challenge from New Mexico where there is a huge Hispanic vote, but I�ve also got information about American Indians. They are solid Democrat voters, almost as much as black people. In New Mexico there was a brand new trick � people got handed provisional ballots. SI: What is a provisional ballot? GP: It�s like a fake ballot, something that will probably never be counted. It�s given to you provisionally, sort of �We don�t know whether we�re going to count this vote� and then it�s looked at and fought about after the elections. It�s up to the official in the state whether a vote gets counted. In the case of Ohio, the current Secretary of State, Blackwell, in charge of the whole process of the vote count, makes Katherine Harris (Secretary of State, Florida, in 2000) look like Thomas Jefferson. SI: I have to tell you that to an outsider it is incomprehensible that someone so obviously partisan is in charge of the vote count. GP: Well, it�s incomprehensible to a lot of Americans. You have people who are violently partisan. In the case of Harris and Blackwell they are actually officials in the Bush campaign. So we have a situation where politicians and campaign officials are in charge of the vote count. Until recently these officials tried to be cautious � but that is no longer the case. SI: Even to outside observers it seems clear that attitudes have hardened and that vote-rigging is much more blatant, even explicit. GP: Right. So much so that Secretary of State Blackwell in Ohio � where Kerry lost � when asked whether he intended to imitate Katherine Harris�s actions in Florida in 2000, replied that �he hadn�t seen Harris on a bread-line last time he looked, she was in Congress�! In other words, do your job well, deliver the state to George Bush and you will be rewarded. In Ohio vicious racist tactics were used. Blackwell handed out registration forms and when they were returned by black people they were told that they were not acceptable because they were on the wrong kind of paper! If you are a black person you are three times as likely to have your registration removed. Now in Ohio we have massive challenges with nearly 200,000 votes locked in provisional votes. In addition we have in the USA � and this is also astounding to Europeans � about 2 million votes which are never counted. They�re thrown out. GP: For technical reasons. Usually we have very bad machinery: people go to vote but it doesn�t register their vote, or there�s an extra mark on the ballot and so on. We know that over half of these approximately 2 million votes were cast by black people. In Ohio this time there were 93,000 votes which were not counted. And doing a check we can tell that overwhelmingly those votes were cast by black and/or poor voters � overwhelmingly Democratic. Now if you add the spoiled ballots to the provisional ballots (and we know who cast both of those categories) then George Bush lost Ohio. SI: How about New Mexico? GP: It�s the same story in New Mexico. There are two problems between the non-count of the vote: we know that if all the votes were actually counted Kerry would have won in New Mexico; and Ohio; and, if you add in the people who were blocked from voting in the first place because they were wrongly removed from the voter roll, we don�t know how many other states would have gone to Kerry. Probably Florida, and a couple of other states as well. So the Republicans have perfected the art of suppressing the black vote. The reason they target the black voters is that they are politically vulnerable people. They are concentrated in certain neighbourhoods so they can give them bad machines or even �back up� the voting. I know of places where lines were so long people were waiting longer than seven hours to vote. The New York Times reported on these long lines but neglected to say that they were in black communities mostly. SI: I wanted to ask about the media in the States. GP: Our press does not face the fact that America maintains an apartheid voting system and it�s getting worse not better. I�ve just been speaking to a polling expert: the exit polls show Kerry winning in Ohio, New Mexico, Florida and several other states. The exit polls are used (by observers) to determine whether the official vote was fixed or not. So we have a mis-match between what people said they voted and the votes registered on the machines. A tremendous problem. A lot of it is accounted for by the fact that so many votes are not counted. So you cast your vote and you have no way of knowing whether it was counted. The other problem is that we�ve moved to computer voting, with very strange results. Especially in small rural counties. It seems it�s easier to play games with the computer and no one notices it or has the power to challenge. So you have a place which is mainly Democrat and voted for a Democrat last time and suddenly you get huge totals for George Bush on machines you cannot check. And that was extreme in Florida. SI: Could you explain the Florida phenomenon � it seems incredible to an outsider that Bush won there after the 2000 debacle! GP: You have to understand that Florida is part of the old South � the old plantation South. Once you leave Miami and Palm Beach you�re in another world. First of all you have the problem that the President�s brother is in charge of the vote count in this crucial state. Then there�s the removal of tens of thousands of so-called �illegal� voters, which, by the way, will be put back onto the voter roll after the election. So you begin with tens of thousands, maybe even a hundred thousand, voters removed. It was worse this time than last. Then there�re also genuinely lost votes � without cheating or fixing � votes which also get lost due to poor machinery. There�s one more factor � a question of culture. SI: What do you mean? GP: There�s a sentiment that all�s fair in love, war and voting. If you can steal a vote, go right ahead! The Democrats used to be the �better� at it, voting dead people and so on in big cities. But now the Republicans have more money and have come up with newer, more elaborate, ways of stopping the vote in all the ways we talked about. And the advent of computers has helped vote fraud enormously. SI: The Republicans seem emboldened. Do you think Kerry conceded too soon? GP: Well, he did the political arithmetic. And he knew it would end up in the Supreme Court which, as we all know, is a fixed institution, a political institution. It took no genius to figure out that although he might have had the votes there was no way they were going to count them. After all, this is a government which appoints puppet dictators in places like Iraq and calls it democracy! SI: And which holds �elections� in some areas only. GP: Yes, that�s right. It sounds ridiculous but this is all dangerous stuff � not only is democracy damaged in America but it has repercussions in the rest of the world. SI: America�s failure to commit to democracy has damaged America�s standing in the world, would you agree? GP: The Bush administration has squandered the world�s goodwill towards America that we enjoyed under Clinton and then the sympathy we had after 9/11. All the goodwill that Clinton built up has been destroyed and thrown away by George Bush. The following excerpts are from an address to Democrat supporters from Congressman Dennis Kucinich in the wake of the US election. You, I and those with whom we�ve worked over the last few years have the opportunity to participate in creating a whole new dialogue in America and the world. We may not have the kind of momentum we had hoped for, which we hoped a Kerry victory would bring, but we do have our own courage � and our own quality of heart � which will hold us in good stead in what will surely be some very challenging times ahead. I think we need to go through this period of grieving over the election, and then we have to get ready to bring some closure and move on, and go to a place of real action again, of real heart-centered action, of willingness to take on the challenges which this administration is bringing to our nation and the world. We need to re-dedicate ourselves to working for peace. Not just further empowering the anti-war movement, but to look at peace as a creative endeavor, where we bring ourselves into working for peace in our relationships, in our communities. The Department of Peace becomes ever more imperative. And the eleven states whose Democratic delegations took a strong stand in favor of a Department of Peace will be focal points of all our efforts to get congressional delegations to begin to sign on in support of this concept, which is aimed at making non-violence an organizing principle in our society. If there was ever a time when we needed that approach, it�s now. In many states across this country, new initiatives are being aimed at the state level to help develop a kind of a universal healthcare approach within a state. People in Oregon tried it a few years ago and I think they�re going to come back. There�s a burgeoning effort in the state of Ohio. We need to look and see what we can do to promote healthcare in this country, and to get people organized around it. We know this administration is not going to be good for the environment � but we also know that we have the opportunity to push forward, at every level, development of alternative energies. You know, we�re looking at soaring natural gas prices in the next few months. This gives us some leverage to get popular support for an effort to develop energy alternatives. But we know with the oil companies having a resurgence in political power with the re-election of George Bush, it gives us also the ability to galvanize public support for the development of alternative energy. This isn�t the first time in our nation�s history that we�ve seen bitter divisiveness � in 1865 in March that Abraham Lincoln faced a nation that was horribly divided in a civil war with massive casualties. And in his second inaugural address, Lincoln said these words: �With malice toward none, with charity for all.� He gave us a lesson that�s valid in our times � not to get pulled into the bitterness and the divisiveness � to still be heartfelt in our communications � to at some point separate ourselves from the anger which we all feel and to move past it, to try and connect with each other once again � through the heart. This campaign, for us, began with an understanding of the world being interconnected and interdependent. It is our connection to all people that causes us to achieve a higher level of compassion. Dimbleby explains that �If every Western nation were to contribute 0.7 per cent of GDP to overseas aid, write off the debt of poorest countries, and eliminate agricultural subsidies to their own farmers, they could find in the order of $785 billion dollars annually for development aid � more than 12 times the present commitment. �Which takes us � or should take us � from global poverty to global warming. It is the greatest challenge facing humanity, to combat both at once � to deliver justice, fairness and prosperity to the poor without destroying the planet in the process. Already we are consuming the Earth�s natural but finite resources faster than they can be replenished. Already Britain�s chief scientific advisor, Sir David King, tells us global warming is a greater threat than global terrorism. This is an extract from Arundhati Roy�s 2004 Sydney Peace Prize lecture delivered at the Seymour Center, Sydney, Australia, on 2 November 2004. �There can be no real peace without justice. And without resistance there will be no justice. Today, it is not merely justice itself, but the idea of justice that is under attack�. �The assault on vulnerable, fragile sections of society is so complete, so cruel and so clever that its sheer audacity has eroded our definition of justice. It has forced us to lower our sights, and curtail our expectations�. �It is becoming more than clear that violating human rights is an inherent and necessary part of the process of implementing a coercive and unjust political and economic structure on the world. Increasingly, human rights violations are being portrayed as the unfortunate, almost accidental, fallout of an otherwise acceptable political and economic system. As though they are a small problem that can be mopped up with a little extra attention from some non-government organization�. �That invasion [of Iraq] will surely go down in history as one of the most cowardly wars ever. It was a war in which a band of rich nations, armed with enough nuclear weapons to destroy the world several times over, rounded on a poor nation, falsely accused it of having nuclear weapons, used the United Nations to force it to disarm, then invaded it, occupied it and are now in the process of selling it. �I speak of Iraq, not because everybody is talking about it, but because it is a sign of things to come. Iraq marks the beginning of a new cycle. It offers us an opportunity to watch the corporate-military cabal that has come to be known as �empire� at work. In the new Iraq, the gloves are off. �As the battle to control the world�s resources intensifies, economic colonialism through formal military aggression is staging a comeback. Iraq is the logical culmination of the process of corporate globalization in which neo-colonialism and neo-liberalism have fused. If we can find it in ourselves to peep behind the curtain of blood, we would glimpse the pitiless transactions taking place backstage. �So what does peace mean in this savage, corporatized, militarized world? What does peace mean to people in occupied Iraq, Palestine, Kashmir, Tibet and Chechnya? Or to the Aboriginal people of Australia? Or the Kurds in Turkey? Or the Dalits and Adivasis of India? What does peace mean to non-Muslims in Islamic countries, or to women in Iran, Saudi Arabia and Afghanistan? What does it mean to the millions who are being uprooted from their lands by dams and development projects? What does peace mean to the poor who are being actively robbed of their resources? For them, peace is war. �We know very well who benefits from war in the age of empire. But we must also ask ourselves honestly who benefits from peace in the age of empire? War-mongering is criminal. But talking of peace without talking of justice could easily become advocacy for a kind of capitulation. And talking of justice without unmasking the institutions and the systems that perpetrate injustice is beyond hypocritical. �It�s easy to blame the poor for being poor. It�s easy to believe that the world is being caught up in an escalating spiral of terrorism and war. That�s what allows George Bush to say: �You�re either with us or with the terrorists.� But that�s a spurious choice. Terrorism is only the privatization of war. Terrorists are the free-marketeers of war. They believe that the legitimate use of violence is not the sole prerogative of the state. "Talking with Angels is the true story of four friends living in Hungary who, in the midst of World War II, received teachings from Beings they called Angels. Benjamin Creme's Master has confirmed that the 'Angels' were in fact the Masters Jesus, Morya and Koot Hoomi, disguised (see 'Questions and Answers' page in Share International January/February 2003). "Living in a small village outside Budapest, Gitta Mallasz and her three Jewish companions, Lili, Joseph, and his wife Hanna, had been deeply disturbed by the increasing numbers of arrests. The period was one of political tension and terror as the Nazis swept across Hungary, capturing and deporting Jews." In 1943 the friends began to receive totally unexpected communications from beings they called 'Angels' Whom we now know to have been Masters. The communications, dialogues and lessons continued for 17 months throughout the extremely tense and difficult period as Hungarian citizens faced mounting danger from both German troops and Hungarian Nazis. The Masters communicated telepathically through Hanna who always retained full consciousness during the teaching; as she spoke Their words Gitta wrote down them down. The friends were taught to acknowledge and deal with their own flaws and frailties; they were called to 'raise themselves up'. Gitta was often overwhelmed by her emotions. Her 'Angel' taught that emotion and sentiment blocked her contact with him. But, he said, if she raised herself "up to the infinite" they could always be together. Her task was "to shine with true feeling", to be so inwardly bright that anyone who looked at her was awakened. False feeling, he told her, moves in waves - loving first one thing, then another. True feeling is inwardly motionless, loves everything, and "shines". He further explained that matter and spirit meet in the eyes, where the force "ignites and radiates out". If, with emotion, you block the rising force of true feeling at the throat, you choke it off, "But if you offer it up to the Divine just as it reaches the throat, the force becomes transformed into Light, which rises up and shines out through the eyes". In one of the later dialogues the 'Angel' told the four: "Raise up your feelings and the vibration will intensify. What raises feelings? Longings? No. Faith? It is only a possibility. The force which raises feelings is the offering of yourself, the giving of yourself." The 'Angels' gave them assurance, support, insight, guidance and taught them relentlessly the need for self-reliance, the rejection of old habits and above all to learn to sweep aside anything in them which would block their own divinity. "Serve! Serve day and night! To stand still is forbidden! You have been entrusted with many talents and you must account for them. Behold! It is wonderful to serve the Divine! Blossom - bear flowers! I implore you!" Gitta Mallasz survived and, although her friends did not, word reached her later that they had managed to serve all those around them in a Nazi concentration camp and reveal their true divine natures in order to raise and comfort others. For the complete article see Share International December 2004.